1. legant design, featuring hand-made natural acacia or rubber wood housing and base. 2. Ultrasonic diffusing feature ensures the integrity of the essential oils’ beneficial molecular structure and allows for ease of healthy bodily absorption. 3. Ultrasonic water-oxygen diffusing produces healthy anions. 4. Timer allows you to set and choose your length of consistent operation. 6. LED light provides soft illumination with 2-level brightness. 7. Combines the benefits of aroma-therapy, aqua-therapy and light-therapy. 8. Unit may also be used as a non-aromatherapy humidifier. * Professional OEM&ODM service, Unique design only for you! We are a HK-based leading manufacturer with factory in mainland ,China, specializing in manufacturing "Ioncare" air-treatment ,products (www.ghcn.com) and "Ellestfun" intelligent sensor-activated home appliances (www.ellestfun.com). 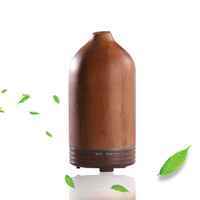 Our products cover an extensive range of aroma diffusers, air humidifiers, air purifiers, ozone/UV sanitizers, automatic dliquid soap dispensers, improving the quality and joys of people's daily lives. Established in 1997, our factory now covers an area of over ,15,000 square foot and possesses complete production lines including plastics mould making, plastic injection, surface treatment, electronic circuit production and a full assembly workshop. With the close-knit cooperation between our creative R&D team, professionally-trained workers, Quality Assurance Department and pioneering marketing crew, we are able to produce and export worldwide more than 1,000,000 sets of electronic products annually, in compliance with major international standards. Original innovative design, guaranteed quality and reasonable price are 3 key factors that make us trusted and regarded by many international manufacturers of well-known brands as their long-term ODM and OEM partner. Come to explore Ioncare/Ellestfun innovative and interesting products right now and you will experience the way how we make your life easier and better! •We are a manufacturer, providing OEM & ODM service. •Usually about 1-3 days by UPS, FedEx or DHL for items with general requirements. •Yes, our products can pass the testings as you require, e.g. : CE, RoHS, ETL, GS, PSE, etc. Q5. How do you control the quality ? •We control the product quality by IQC, QA on production lines, 100% aging testing before packaging, and FQC before warehousing finished products. We strictly follow the whole quality standards set by ISO 90001. •Normally our MOQ is 1000PCS, but 500PCS for new models, and even smaller trial orders for certain items are acceptable. •Of course, a favorable discount will be offered if the quantity is sizable. •We usually ship them by sea for normal delivery or by air for urgent delivery.